U.S. military officials confirmed on Wednesday that Air Force F-22 stealth fighter jets intercepted two Russian nuclear-capable bombers near Alaska on Tuesday. 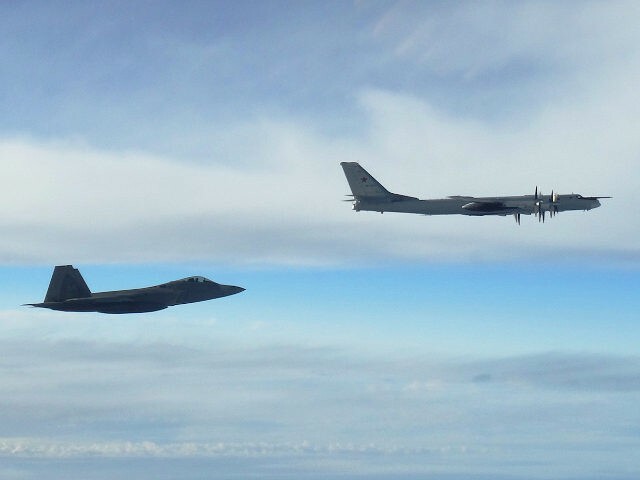 According to a statement from the North American Aerospace Defense Command (NORAD) on Wednesday, two Russian Tu-95 “Bear” bombers and two Su-35 “Flanker” fighter jets crossed into the Alaska Air Defense Identification Zone (ADIZ) on Tuesday. The incident reportedly took place at 22:00 (10 p.m.) Eastern Time. Russian state media said that American jets escorted their aircraft for approximately 40 minutes but never approached closer than 100 meters. Although the Alaska ADIZ is not over American territory, the zone is regularly monitored in the interests of national security. All nations have the right under international law to establish an ADIZ over land or maritime territory. “The homeland is no longer a sanctuary, and the ability to deter and defeat threats to our citizens, vital infrastructure, and national institutions starts with successfully detecting, tracking, and positively identifying aircraft of interest approaching U.S. and Canadian airspace,” added NORAD commander Gen. Terrence J. O’Shaughnessy. It is the second time this month that Russian bombers have flown near Alaska. On September 1, two bombers were intercepted by F-22 fighters after crossing into the Alaskan Air Defense Identification Zone south of the Aleutian Islands. Russia is currently holding its Vostok-2018 drills, its largest show of military force since 1981 at the height of the Cold War. The drills involve a total of 297,000 service personnel, over 1,000 aircraft, 36,000 tanks, and other vehicles, as well as 80 warships. Chinese and Mongolian troops are also taking part in the exercises. In January, footage released by the Pentagon showed a Russian fighter jet buzzing past a U.S. Navy spy plane flying through international airspace. State Department spokeswoman Heather Nauert said at the time the U.S. noted with the “highest level of concern the latest incident of unsafe Russian military practices,” before accusing Russia of “flagrantly violating” international agreements. There have also been multiple incidents between Russian and U.S. jets in and around Syrian airspace. In April, U.S. officials revealed that Russian military had begun scrambling American drones operating in Syria in a move to damage their operations.